Sharp MX-5141N PCL6 Driver, Scanner, Software for Mac, Linux, Windows 10, 8/8.1, 7, XP, Vista & Manual Installation, Toner Cartridges - Enhanced operability, fast 51/41-ppm output, breathtaking image quality, & convenient mobile access make the Sharp MX-5141N/4141N an ultra-productive document hub. The Sharp MX-5141N/4141N delivers fast, high-resolution copying & printing to render text documents, photographs, illustrations, maps, and graphs--including fine lines and small print with breathtaking precision & clarity. Simple hand gestures and a 10.1-inch colour LCD touchscreen let even first-time users navigate the Sharp MX-5141N/4141N with ease. Thanks to multi-touch operation, two finger pinch and spread gestures facilitate Web browsing and make it easy to shrink and enlarge images in Advanced Preview. Equally easy one-touch commands, such as flick, drag, and tap, provide quick onscreen access to MFP functions and ultra-smooth intuitive operation. As document demands increasingly move from out behind the desk to wherever business takes you, Sharpdesk Mobile--an easy-access mobile print/scan application that connects Sharp MFPs to popular mobile devices via a wireless LAN connection--can help you keep pace. Documents scanned on a Sharp MFP can be sent to a mobile device to preview and save. And documents saved on a mobile device can be printed out on the MFP, sent as e-mail attachments, or used in other applications. By combining the efficiency of Sharp MFPs and the convenience of mobile devices, Sharpdesk Mobile is adapting document usage to today's changing work styles. The genuine Sharp MX-5141N black toner cartridge (MX-51NTBA) yields an estimated 40,000 pages. The Sharp MX-5141N three color toner cartridges in; cyan (MX-51NTCA), magenta (MX-51NTMA), and yellow (MX-51NTYA) have an estimated yield of 18,000 pages--with a 5 percent average page coverage. The micro-fine toner, technology produces impressive images and defined text. 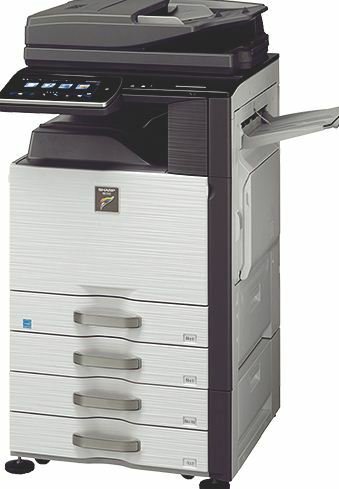 Offices rely on the standard paper capacity of 1,100 sheets on the Sharp MX-5141N. For even more flexible paper handling an optional paper feeder and large capacity tray can deliver up to 6,600-sheets. Each paper source on the MX-5141N can hold a different paper size and media type. To maximize the paper handling on the MX-5141N optional finishers can complete more projects in-house.